These cute nails started as something I wanted to do all the same, but I just kept experimenting and decorating my nails with different tools. Paint base coat onto nails. Paint all nails black. Let dry. 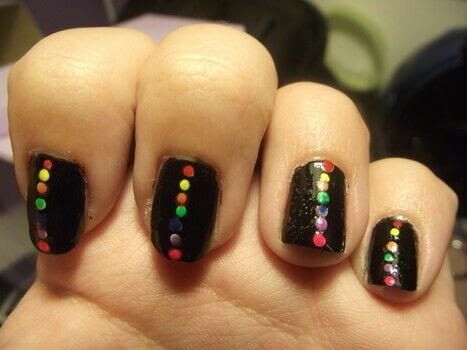 Take your dotting tool and put a line of white dots down the middle of each nail. 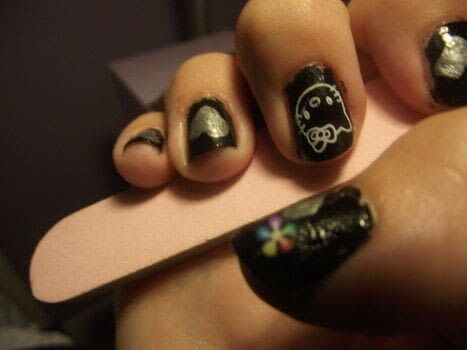 You can do this on all nails or just one hand. On the thumb do a square of dots 7 x 7. Let dry. On top of the white dots put dots in this order: red, orange, yellow, green, blue, purple, pink. If you want, slice some fimo cane and stick it on top of your nail using clear polish. 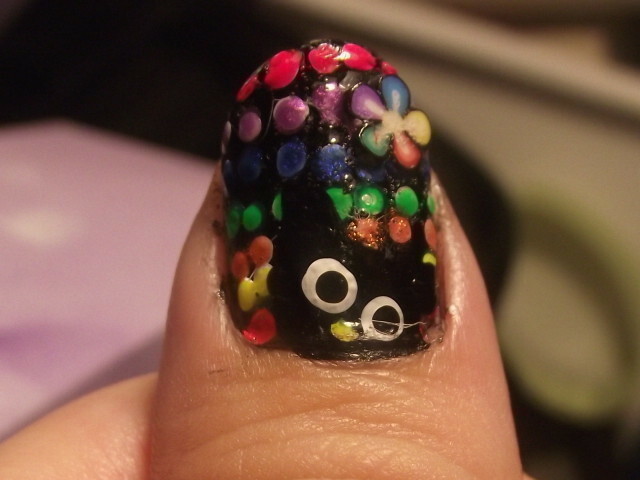 You can also do a konad design on some of your nails. I did a white hello kitty on my middle finger of my right hand. To do the hearts and choco cat on my thumb, tape the sandwich bag taught over a book or something hard. Draw the design using your dotting tools. Make sure the polish is thick. Wait a few hours or a day for it to dry then carefully peel off and stick on with clear polish. Thank you. To do the cat, you take a plastic bag (like a ziploc sandwich bag) and tape it to something hard like a book so it is stretched out flat. Draw the cat onto the bag with nail polish, and make sure that you make the nailpolish thick. 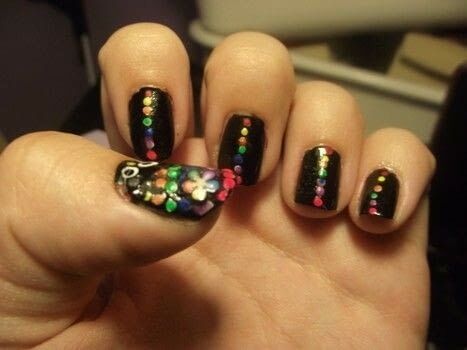 Wait a few hours, peel off the design, then use clear nailpolish to attach to your nail. I am confused on how to do the hello kitty! Please explain because it's really cool!